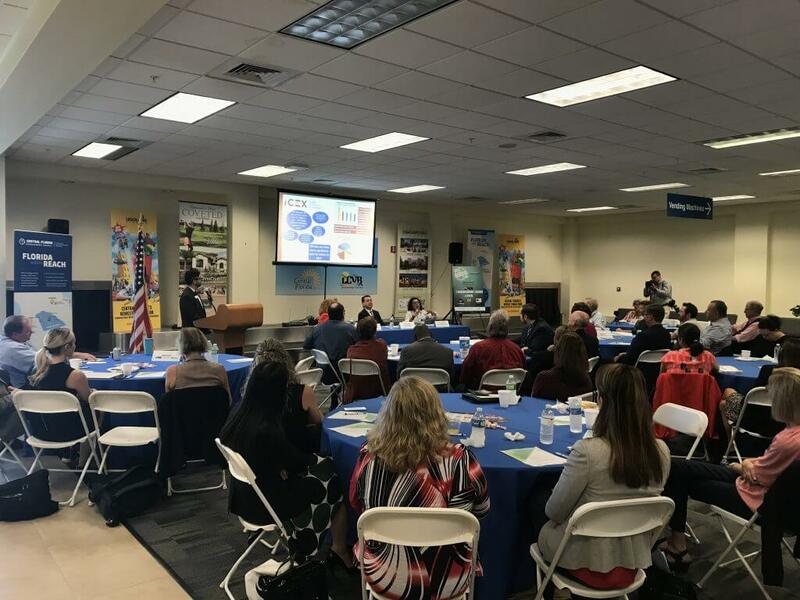 Central Florida is one of the most important trade communities in the world, and it’s in a unique position to benefit from ongoing conversations on the topic, said Bill Lane, executive director of Trade for America. “Whether you’re on the right or left politically … on things that are really important to your community, you point it out, you communicate,” Lane said at the Polk Goes Global IV symposium on tariffs and their impact. “The great thing that’s going on right now is everyone in this room” is talking about trade. Trade includes imports and exports, everything from goods and services to innovations and employees. “Any time we have tourists here, it shows up as an export. When they go to Costco and get good deals, they buy things to take home, which is an export,” Lane said at the Nov. 9 event at Lakeland Linder International Airport. The symposium, the fourth, was sponsored by the Central Florida Development Council and the Lakeland Chamber of Commerce and the Greater Winter Haven Chambers of Commerce. Florida relies heavily on trade, exporting $93 billion, Lane said. More than 2.2 million jobs are supported by trade. Inke Sexton, a process manager for Givaudan Flavors Corp., which makes flavors for almost every food and beverage in the grocery store, said Givaudan in Lakeland is not as affected by tariffs, but other locations in her company are, and it’s getting expensive. A lot of raw materials are being bought in from China, the only place they are being produced, Sexton said. The 15 percent to 25 percent tariffs end up in the grocery store, and consumers pay for them. In addition, smaller companies are having problems paying for the tariffs, she said. Trade and tariffs have been in the news this year as President Donald Trump has imposed tariffs on several trading partners, infuriating them and prompting them to retaliate with tariffs on U.S. products. High tariffs hurt trade, Lane said. Canada and the United States make products together, creating hardship when tariffs are imposed, she said. President Trump has imposed a 25 percent tariff on steel and 10 percent tariff on aluminum from Canada, increasing the price of things like cars that are made half in the United States and half in Canada. “We should minimize politics so business people can cross the border with almost no barriers,” Harper said. Harper said the administration’s tone has caused a chilling effect. “We need to increase stability,” she said. Inmaculada Gutierrez, trade commissioner of the Embassy of Spain at the consulate of Spain in Miami, said Spain buys everything from medical devices to airplanes from the United States. But foreign investment in the United States trumps imports, she said. The Foreign Direct Investment — an investment a person or company from one country makes in another country — was $5 trillion in 2017, she said. A recent foreign investment in Polk County has put people to work in local jobs, in addition to new capital investment, said Javier Marin, the CFDC’s director of business development and global trade. “Move more goods, people and services through Florida’s international gateways. Make more goods, services, innovations and ideas for export to international markets. Multiply the impact of international trade across Florida’s economy by increasing … supply chain and trade-related services,” according to the Florida chamber. Florida now trades with more countries than it did in 2014, adding Mexico to the list, bringing in exports through ports, not just by truck, Ancona said. It also trades extensively with Canada, the United Kingdom and Germany, she said. “These are high-end exports that we make,” including medical devices. Florida is the gateway to the world, especially South America. “Brazil is our No. 1 export destination,” she said. Trade with Canada and Mexico has increased 290 percent since 1993, Lane said. Ancona said that 50 percent of consumer goods sold in Mexico are manufactured in the United States. This year, Florida will export $42 billion in products we make (it also exports products from other states that are not included in this number). As of July, tariffs will have an estimated impact of $2.2 billion, Ancona said, which has forced us to change. “We diversified who we trade with,” she said. Canada, for instances, trades services as well as goods with Florida. Retail tariffs have hurt the agriculture community, Lane said, and that must change. Companies that come here are looking for “a talented, educated workforce” — the No. 1 interest, Ancona said. Florida universities are graduating a lot of students who are available to work for international companies that want to locate here. A lot of foreign students come to Florida to study, paying the higher out-of-state tuition rate, but some are now wondering whether they will be welcome here, Ancona said. In fact, some are now going to Canada. That hurts the United States. International students are one of the most-important clientele, Lane said. They go back and talk positively about our country. With more than a half-dozen colleges and universities, Polk County plays a role in international students — either teaching those from other countries or preparing Americans to work overseas. Dr. Angela Garcia Falconetti said Polk State is globalizing its campus, including offering more and more study-abroad programs, which help prepare students — especially those who graduate from the aviation program — for international positions.